Melbourne’s CBD isn’t quite as hard to access as Sydney’s, but it’s still no walk in the park. The Macedon Ranges on the west and the Kinglake Ranges on the east restrict northern access to a single corridor; all plausible alignments pass roughly through Heathcote Junction. From there, there are really only four main options: The Craigieburn Line or the Upfield line (both of which take a more-or-less direct route to Heathcote Junction), the Sunshine Line (which goes a bit out of the way to the west) or the Whittlesea Line (which goes even more out of the way to the east). The freeway corridors don’t really bear consideration; the ones that go in even vaguely useful directions are already fully utilised by highway infrastructure, and their geometry isn’t favourable for high-speed rail. So first, let’s look at the very different approaches the two recent high-speed rail studies have taken. AECOM study’s proposed entry corridor to Melbourne. Image: AECOM13, Appendix 3A page 96. 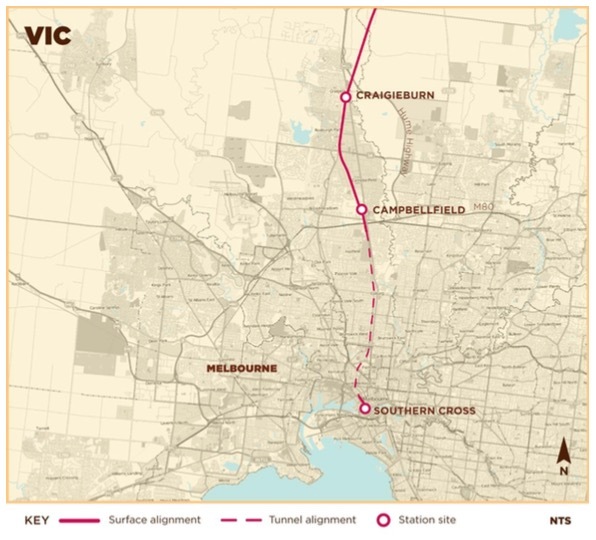 The 2013 AECOM study proposed utilising the Upfield corridor, but decided due to space constraints to enter a 15km tunnel at Gowrie in Melbourne’s north. The tunnel would be a shallow cut-and-cover type, which would arguably be cheaper to construct than a deep-bore tunnel. 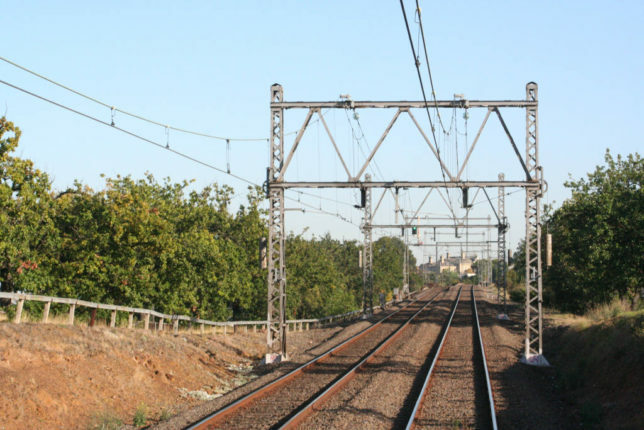 However, it would severely disrupt suburban Upfield line services during construction. AECOM projected that the Upfield corridor option would cost $3.4 billion between Wallan and Southern Cross Station (Appendix 38 pp 94). That’s an average cost of $85 million per kilometre, a phenomenally high cost when you consider that most of it is at-grade, and in an existing corridor. But a 15km tunnel specified to 400km/h will cost $2.2 billion on its own. It is possible that a more sensible treatment of the Upfield corridor would be substantially cheaper; more on that later. The 2014 study by Beyond Zero Emissions proposed an alternative alignment to the west, departing the Northeast rail corridor at Beveridge Road, passing close to Yuroke and Tullamarine Airport, then rejoining the Albion-Jacana freight line at the Calder Freeway interchange, and using the Sunshine Line to access inner Melbourne. The final 6.5km is in tunnel. This route was taken in order to facilitate access to Melbourne Airport, which is currently poorly served by public transport in a city that prides itself on its excellent public transport network. However it has the disadvantage of being significantly longer, having restricted speeds due to poorer geometry, and also requiring far more construction of entirely new corridor than the AECOM alternative. Nevertheless, BZE’s estimated cost is far lower due to having less length in tunnel. Between Wallan and Southern Cross, BZE’s estimated cost was $2.5 billion, offering a travel time of 12 minutes between Southern Cross and Tullamarine. A slower option, eliminating the elevated section and sharing the Sunshine line with suburban traffic, is projected to cost $1.2 billion and take 16 minutes. To be honest, the BZE option is very appealing. 12 or even 16 minutes to Tullamarine would be a revolutionary time saving, and serving the airport is a huge tick in its favour, not to mention the possibility of continuing the Sunshine corridor to the west to serve additional major destinations like Ballarat. But let’s look at some other options as well. Additional corridors considered by AECOM. 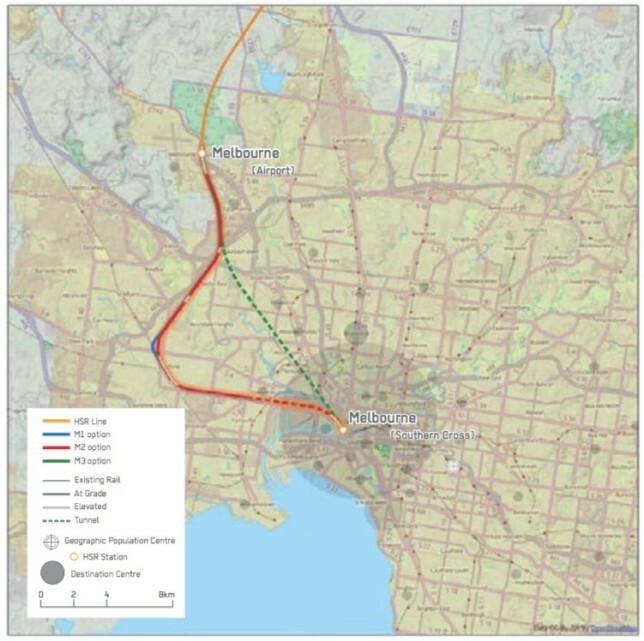 Whittlesea Corridor is grey at far right, while Broadmeadows is grey between Melbourne and Jacana. The other two rail corridors serving the north of Melbourne are the Craigieburn and Whittlesea corridors. The a quadruplication of the Craigieburn line was actually proposed to be used by the 1991 Very Fast Train Joint Venture (it was then known as the Broadmeadowns Line). However, the density of Melbourne’s development has increased so drastically since then that it is unlikely that this strategy would still be viable today. At any rate, the geometry of the Craigieburn line is generally too poor for high-speed rail, with curve radius down to about 600m, and a narrow 25m-wide corridor. Strike out the Craigieburn corridor. That leaves the Whittlesea corridor. Starting off sharing the Epping/South Morang line, the now-abandoned Whittlesea line diverges at Reservoir, proceeding northeasterly with quite favourable curve geometry. Although it ends up getting us quite a distance east of Heathcote Junction, the farmland in between is flat and would not present significant barriers to railway construction. The downside is an extra 10km in total length, and unfavourable geometry in the final few kilometres to Southern Cross Station. There would still be significant construction obstacles to quadruplicating the Epping line prior to Reservoir, an expensive but do-able proposition. But then if you’re quadding narrow Melbourne rail corridors, you might as well do Upfield and get better geometry and a shorter route. Strike out Whittlesea. In this author’s opinion therefore, a quadruplication of the Upfield corridor is the most promising option. Impossible? No, there’s enough room in the 20m-wide corridor for four tracks (just). Difficult? Sure, it’s not going to be cheap. But neither is a 15km tunnel. A quadruplicated Upfield line would require dual noise-attenuation walls either side of the corridor, for safety as much as anything else. Another option would be to put two, or all four of the tracks in a trench with dual retaining walls, or maybe elevate some sections. And the existing stations will likely require substantial remodelling, if not outright replacement. This is all going to be expensive – really expensive. But as we have seen, no option for getting out of Melbourne is going to be cheap. Even the slowest option, sharing the Sunshine corridor with suburban services at 100km/h or less, will be well north of a billion dollars. That’s the base case. I like BZE’s concept, especially for the possibilities it offers of serving additional western destinations like Bendigo, Ballarat and Warrnambool (and Adelaide, eventually?) but I also think the Hot Rails design philosophy could deliver a very direct Upfield corridor alignment at a fraction of AECOM’s cost. 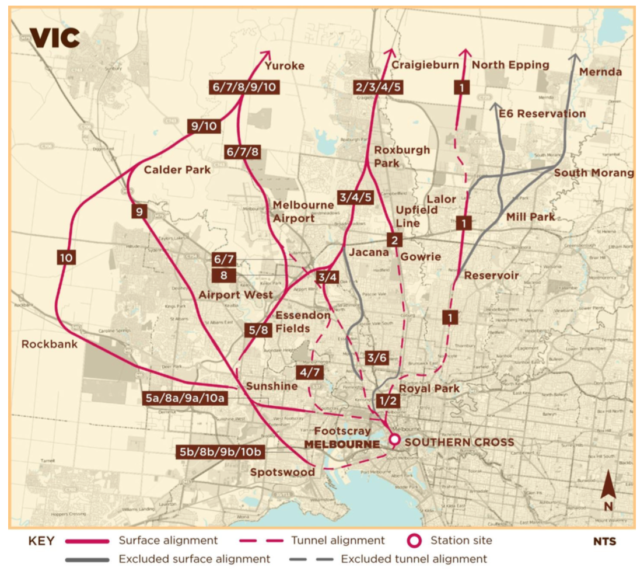 AECOM, airport, corridor, Melbourne, tunnels. Bookmark.